Organized by: Cisco Srbija, University of Belgrade, School of Electrical Engineering. The Institute of Networked and Embedded Systems of the University of Klagenfurt also hosted the Seminar in the Lakeside Park, B02.1.59 (meeting and conference room). More details are available in the linked poster. 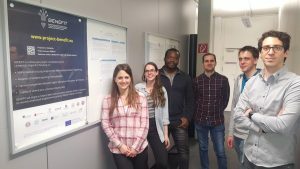 The Institute of Networked and Embedded Systems of the University of Klagenfurt hosted an OpenLab evening on March 13th at 5pm in the Lakeside Park in B04a, Klagenfurt, Austria. Students presented exciting projects to give an insight into their work and research fields. Project Benefit was also presented to all visitors. On 26.9.2018 Open Day was held at Faculty of Electrical Engineering, University of Ljubljana. 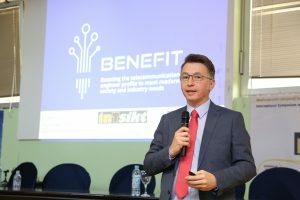 The aim ofthe Open day was to present BENEFIT project activities to professors, experts, professionals and students from Slovenia. 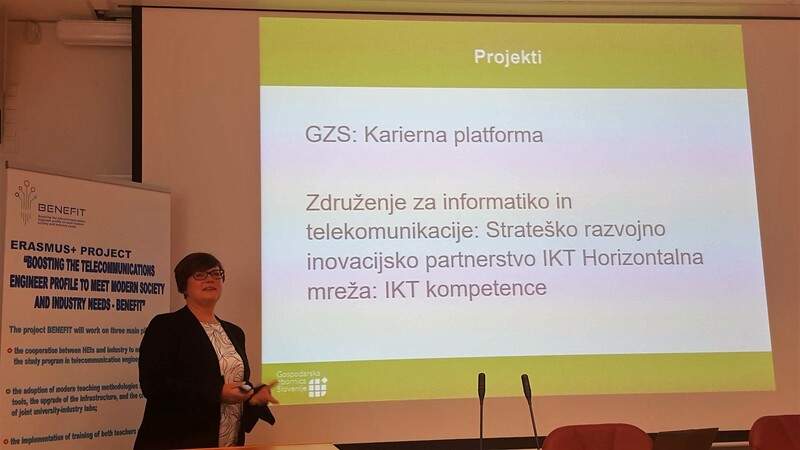 Altogether there were 20 participants, besides UL also KLU, UNTZ, UNS and ENT were present and actively participating with presentations and discussion.Short presentations were also given by representatives of students, university career centre, Slovenian Chamber of commerce and HR personnel from industry as well from CMPEPIUS (Erasmus+ office), according to the program.The first part that consisted of short presentations was followed with discussion on major topics covered by the presenters, as for example student’s career portal, modernization of curriculum, industry needs, etc.Overall conclusion was that there exists mutual motivation for future cooperation among the participants of the event. It is our aim to keep close contacts with the participating people throughout the duration of the project and beyond. Website. 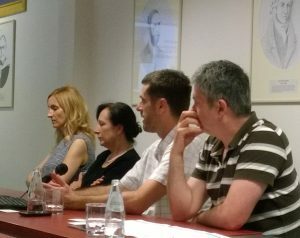 Larisa Grizilo, Senior direktorica HR sektorja in korporativnih komunikacij, A1: Nad milenijce z (digitalno) palčko, (digitalnim) korenčkom ali z (digitalnim) čim drugim? / Engage millenials with (digital) carrot or (digital) stick or (digital) something else? Kratkim predstavitvam bo sledila diskusija / Short presentations will be followed by open discussion. 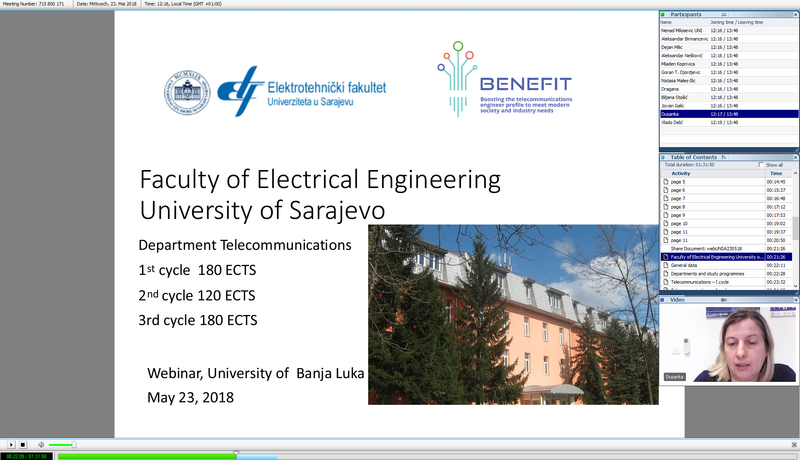 The Webinar “Study programs in telecommunications”, hosted by the University of Banja Luka and technically supported by the University of Belgrade, were held on May, 23rd, 2018, from 12:16 pm to 01:48 pm. All project partners were invited to participate and distribute information about the webinar. The webinar was announced to students and selected group of high school students (potential candidates for enrollment to telecommunication study programes). 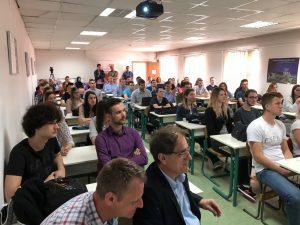 Interested participants had possibilities to register by sending an email and participate by coming to the Faculty of Electrical Engineering, University of Banja Luka or online. InTsikt is an annual event with a focus on latest achievements in information and communication technologies. It is plenary organized and focused on knowledge and experience exchange between academia and industry. The topic of InTsikt 2018 was “Bridging Digital Divide”. 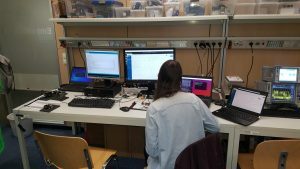 InTsikt is prepared and organized by Faculty of Electrical Engineering Tuzla, Faculty of Electrical Engineering Ljubljana and BIT Center Tuzla, and technically sponsored by IEEE Section of Bosnia and Herzegovina. Total number of participants at InTsikt 2018 is 70. 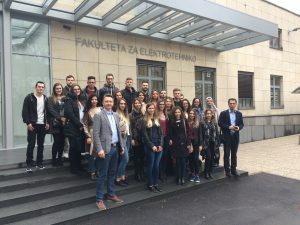 Students of University of Tuzla expressed their interest for the project, and had opportunity to exchange impressions with professors from partner universities. Television of Tuzla Canton and RTV 7 reported about this event. 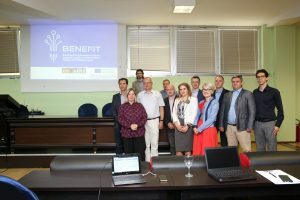 During InTsikt, University of Tuzla (UNTZ) and Faculty of Electrical Engineering and Computer Science in Osijek (FERIT) signed joint Memorandum of collaboration with the company AV Living Lab Ljubljana, Slovenia in the domain of autonomous vehicles. University of Tuzla organized an open event to present project BENEFIT to students and local community in Tuzla and Bosnia and Herzegovina. The event was organized at Faculty of Electrical Engineering on May 17 2018, the world day of telecommunications. 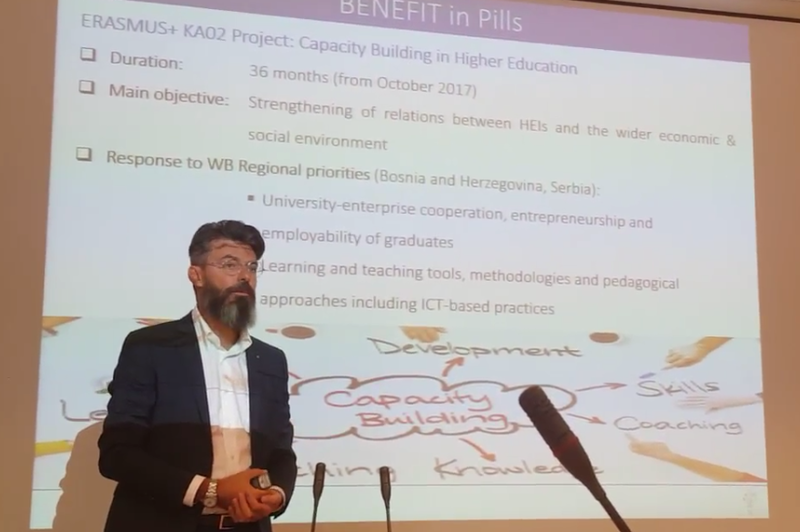 Prof. dr. Nermin Suljanović and prof. dr. Aljo Mujčić presented the scope of the project BENEFIT and aims, while doc. dr. Asmir Gogić provided more details on the development of joint lab with Bicom Systems. Vedrana Ajanović, BIT Center Tuzla, and Nerina Bolić, Bicom Systems, talked about internship opportunities for students of Faculty of Electrical Engineering Tuzla, in the scope of the BENEFIT project. 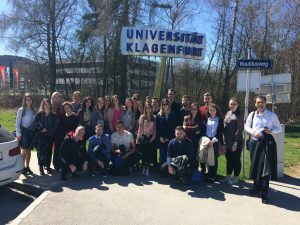 ELEMEND, second Erasmus + project implemented at University of Tuzla, has also been introduced. Television of Tuzla Canton reported about this event. 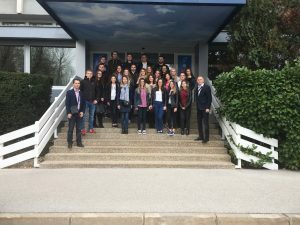 Students of the third and fourth year of telecommunication studies at University of Tuzla visited BENEFIT partners Ericsson Nikola Tesla Zagreb, University of Ljubljana and Alpen Adria University Klagenfurt. The three days study trip took place in April of 2018, from 4th to 7th. 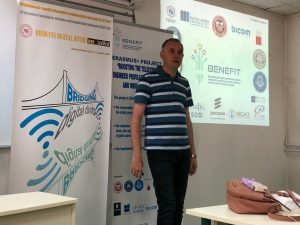 Experts at Ericsson Nikola Tesla in Zagreb presented their work environment, the most interesting projects in ICT they are working on and opportunities for the student internships in this company offered in BENEFIT project. 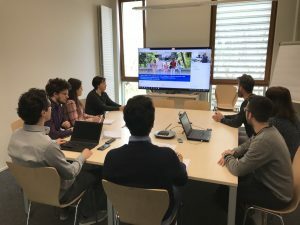 Students are informed at University of Ljubljana and Alpen Adria University about undergraduate and graduate programs, study details and student life. In the scope of the visit, students also visited laboratories and participated in demo lab experiments.